Intel’s Haswell processor line may have gotten all the glory at Computex this weekend, but ten years down the line, we may just remember Computex 2013 as the year that Intel’s most portable CPUs were finally embraced by mobile manufacturers. Intel’s portable technology has made waves before, of course—remember those x86 smartphone processors from 2012? But for the first time ever, it’s looking as though all of Intel’s pie-in-the-sky promises are truly turning into real-world hardware wins. The prospect already has ARM bristling to defend its turf. “If Intel continues on its trajectory, we’re going to look back on [Computex 2013] and say not necessarily that it’s where Intel’s mobile push started, but that it’s where it started to gain traction,” says Patrick Moorhead, founder and principal analyst at Moor Insights and Strategy. Let’s take a peek at that traction in action, starting with honest-to-goodness Android tablets with Intel Inside. While Intel has notched a few Android smartphone wins on its post, it was never able to convince a big manufacturer to take a stab at a proper Atom-powered Android tablet—until Computex, that is. And at Computex, it landed one of the biggest fish swimming around in the Android ocean: Samsung. 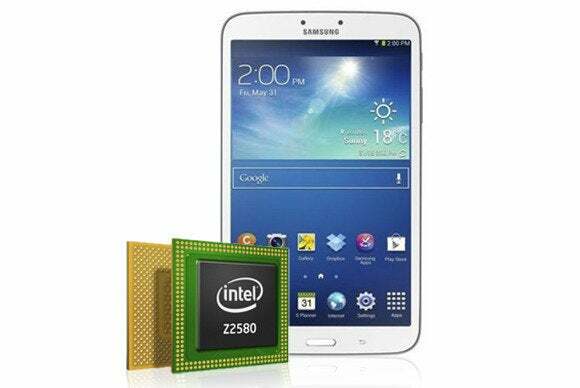 While the 8-inch Galaxy Tab unveiled Monday runs a standard ARM processor, the 10.1-inch flagship model sports a dual-core Intel chip of unspecified design. Since the tablet is due to launch in June, look for it to likely rock the “Clover Field+” Atom system-on-a-chip popular in today’s Windows tablets, rather than the next-gen, Silvermont-based “Bay Trail” processors slated for release by the holidays. Even so, it’s a humongous win for Intel. More impressively, Intel won over Samsung despite the fact that 32nm Clover Trail chips aren’t as slim as the 28nm ARM chips favored today, and that many Android apps have to be translated on-the-fly to ensure compatibility with Intel’s x86 architecture. Don’t celebrate too much just yet, however. “Intel still has a lot of work to do and its market share in the mobile space, be it tablet or smartphone, is very, very small,” CCS Insight analyst Geoff Blaber told IDG News Service earlier today. The Intel-powered Asus Fonepad Note phablet. That’s very, very true—but Intel’s processors didn’t just pop up in the Galaxy Tab. Clover Trail could also be found in the bizarre Asus Transformer Book Trio laptop-desktop-tablet “frankenconvertible” (as Moorhead calls it) that runs both Android and Windows; the 10-inch Asus Memo Pad FHD; and even the 6-inch Asus Fonepad Note phablet. Asus, it seems, is at least partially won over. Intel’s Clover Trail processor can also be found in the world’s first 8-inch Windows tablet, the Acer Iconia W3. That, in fact, brings up a whole ’nother problem for ARM, and a whole ’nother win for Intel. At this year’s Computex there’s nary a Windows RT tablet to be seen, while last year manufacturers were showing off ARM-powered slates like the Asus VivoTab. Windows RT’s absence from Asia’s biggest trade show is nothing short of glaring, especially when you consider how most manufacturers were tripping over themselves to show off Windows RT slates—which run on ARM processors and aren’t compatible with classic Windows desktop programs—at last year’s show. In the 12 months since, manufacturers, developers, and consumers alike have avoided Windows RT like the plague. That’s bad news for Microsoft and ARM, but it’s wonderful news for Intel. Manufacturers are rolling out droves of Windows tablets, but virtually all of those tablets run the full-blown version of Windows 8 on top of Intel’s x86 silicon, rather than the crippled monstrosity that is Windows RT. There’s a reason for that. The mere threat posed by Microsoft’s ARM adoption spurred Intel into action, prompting it to devote its near-endless resources on energy efficiency. “The power and performance gap to ARM for Intel Atom is a myth now,” Blaber says. And when Intel’s Atom or one of AMD’s mobile processors offer a true Windows experience and last just as long as an ARM chip, settling for Windows RT’s sea of compromises just doesn’t make much sense. Manufacturers know that. Bay Trail chips will be even more powerful and long-lasting than the Clover Trail processors winning the hearts and hardware of manufacturers today. 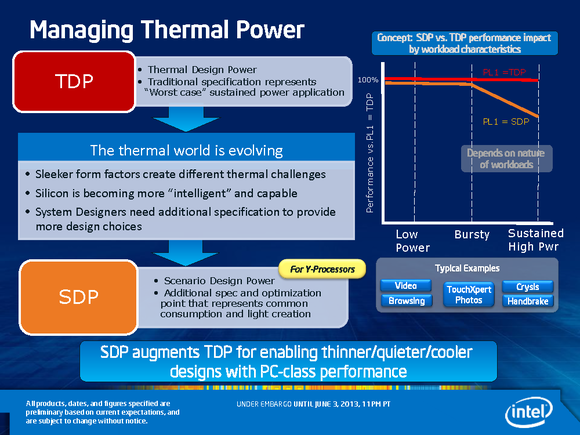 Haswell’s mobile power efficiencies are paving the way for a future where tablets can offer full laptop power with none of the compromises found in the powerful slates like the Surface Pro and Razer Edge Pro. Intel’s sudden mobile threat has prompted ARM to rattle its saber. The company unveiled a new Cortex-A12 processor, and at a Computex news conference of its own, the company claimed that its mobile processors are superior to Intel’s much-ballyhooed Silvermont Atom technology. Analysts feel that Intel and ARM are now fairly equal on the performance-per-watt front, however, and Moorhead thinks Intel’s refocusing on the mobile market—could—make things interesting going forward. We’ve said it before, and we’ll say it again: Intel’s future hinges on cracking the mobile market as the masses migrate to tablet technology. Cornering the moribund Windows slate market and achieving a handful of Android design wins isn’t anywhere near a resounding success, but Computex 2013 certainly shows that Intel isn’t just spinning its wheels. Chipzilla’s long-term plan for mobile is on the right track and gaining traction.